Emerged from nymph on Wire Lettuce, Stephanomera pauciflora. Glendale, Maricopa Co., Arizona, USA. 7 April 2015. The immature or nymph stages are entirely sedentary beneath a mucousy froth of spittle on the host plant. There they draw sap through straw-like mouthparts from the plant stem using the excess moisture to produce the spittle. The spittle may protect the bug from the sun and predators. 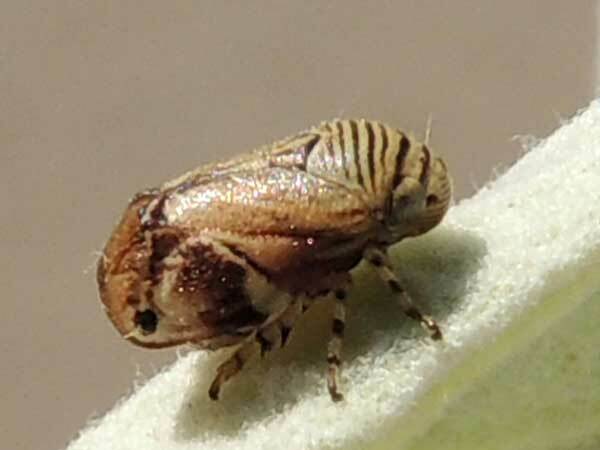 The mature spittlebug leaves its protective froth of spittle and resembles minute, stubby leafhopper. This species has a fake eyespot on the hindwings that I presume causes insectivorous birds some confusion. The large eyes on the head and the ability to jump fast while taking wing allow more escape tools. This might be the same species that is common on rosemary, a common landscape plant in the Phoenix and Tucson areas. Copyright Michael J. Plagens, page created 11 April 2015.